This week’s Buried Treasure begins with a tutorial from the past on how to color Easter eggs naturally. The original post, “How to dye eggs naturally for a new Easter Zentangle tradition” also contains tips for best results as well as links to several other very good online resources – love all the gorgeous pastel colors. “With Easter and Passover approaching next weekend, thoughts of decorating eggs might be on your mind. After checking to make sure the original tutorial links still worked (they do), I came across this excellent video to complement the original tutorial. Sarah Johnson uses a purchased coloring kit for her eggs, but I’m including this video for the design ideas she demonstrates because they can also work with the natural dyes suggested in the TanglePatterns tutorial. For similar design ideas, check out the Epicurious article, “To dye Easter eggs” – see the Test-Kitchen Tips section in the “recipe”. Think of this as your tangle Challenge, if you’re so inclined. 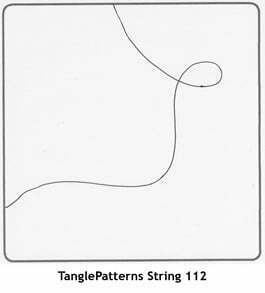 TanglePatterns String 112 is from tangler Yamit Fridman and was originally posted here.